Mortgage rates hit an all-time low this week, presenting US homeowners and real estate investors with an opportunity to decrease their mortgage expenditures. It appears as though the Fed and Treasury are doing something right in their efforts to shore up the homeowner in the midst of the credit carnage. For those fortunate enough to have the equity and credit rating to either refinance or buy a new home, for this first time ever, rates on conventional 30 year mortgages have dipped below 5% to 4.96%. This table demonstrates the benefit of refinancing at various rates and mortgage amounts. If rates continue to drop and eventually reach 4% for a 15 year mortgage, you may soon see consumers refinancing from 30 year loans right into 15 year loans with only a marginal increase. What do you think? How low do rates have to go before you refinance? 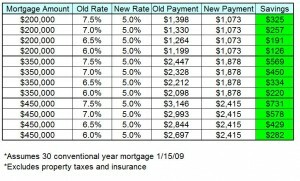 Lowest Mortgage Refinance Rate Comparison by the Readers! Mortgage Rates Dropping to Record Low – Time to Refinance? Toll 3.99% Mortgages – What’s the Catch? I am very interested in a refi. Seems though that the advertised rates are not applicapble in NJ, as the quotes I have gotten are higher than what is seen online. Also, the companies seem to be overwhelmed with requests and the service/response time has been awful. Yes, I’ve heard mixed messages from people I talk to about everything from rates to “no-closing” cost options, which then slap you with appraisal and title search fees. I would advise that you continue to shop around and market economics being what it is, there should be at least some competition out there to refi people with strong credit. Please do come back and report on findings, top lenders and rates. I’ll be posting on this every few weeks as rates continue to drop since I’ll be taking advantage of a lower rate soon myself.